For the 4th year in a row, my elementary school students participated in the annual national Hour of Code activities launched during Computer Science Education Week back in December 2013. While I’ve written about the different apps students have used in my library classroom, about the idea of understanding coding as a new literacy, and how coding contributes to building a growth mindset, I decided to approach this year’s Hour of Code from a slightly different angle. This year, my goal for my K-2 students was to integrate reading responses with coding skills. At this age, coding is all about building a relationship with algorithms — a list of instructions that can be followed to finish a task. Think about the steps involved in making a peanut butter and jelly sandwich or tying your shoes or, as we did in class, drawing a smiley face or planting a seed. All instructions have to be completed in a certain sequence in order to accomplish the task. We started our mini-units with unplugged lessons and then designed algorithms to create digital projects using the Scratch Jr. app for iPad. After reading There Was an Old Lady Who Swallowed a Dreidel by Caryn Yacowitz (David Slonim, illus. ), Kindergarten students completed a coding sheet drawing arrows in the correct order of events. I adapted this algorithm coding activity from JDaniel4’sMom. 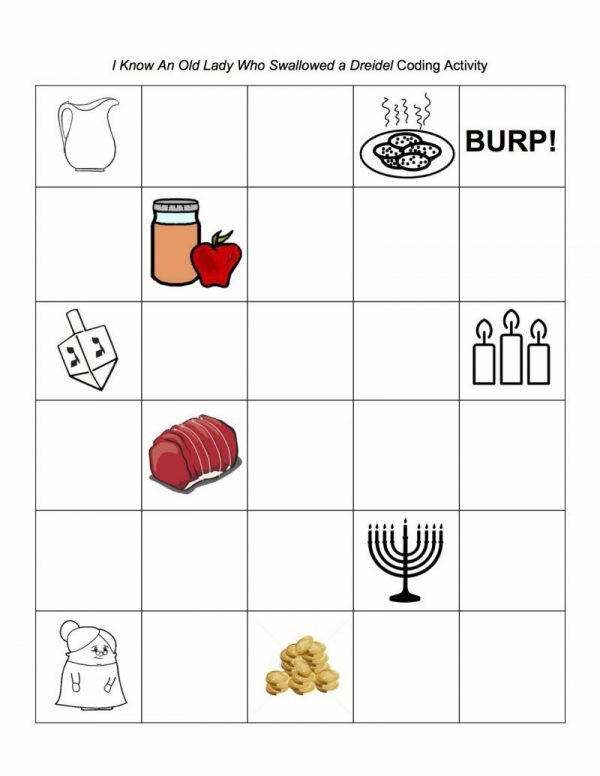 On a story grid template, students placed up, down, left, and right arrows to sequence the events of the story–the Old Lady devouring ever greater Hanukkah foods and symbols– and thereby creating an algorithm that would at last reconnect her with her family. In our final lesson, students applied sequencing skills to create a simple animated Hanukkah greeting card. The instructions were to choose a background from the app’s library, draw a Hanukkah symbol, and then animate the symbol by sequencing block commands. Coding requires these young students to create an algorithm in such a way that a machine, i.e. iPad, could carry it out. As such coding supports computational thinking, communication and, as these projects illustrate, is a very creative way for students to express themselves and share their ideas. For me, coding has proven to be another great digital tool to use for student reading and listening responses. I started teaching unplugged coding lessons last year and am a huge fan as they allow students to directly master relevant concepts. When, for example, I asked one of the classes for directions to draw a smiley face, they quickly understood that it is not enough to simply say, “Draw two eyes”. Instead, students needed to provide the geometric shape and the exact location where they should appear–a good opportunity to talk about “precise instructions” and the fact that machines cannot interpret what one may mean. There are some great unplugged lessons published by Code.org. I used “Plant a Seed” with my 1st-grade students, where students related the concept of algorithms back to a real-life activity, planting a seed, and I used “Move It, Move It” with my 2nd-grade students, where students practiced controlling one another using a simple combination of hand gestures. The goal here was for students to understand the importance of giving precise instructions in order to complete a task. For the literacy piece, 1st-grade students coded the setting (a house) and the main character (a dinosaur) from the story How Do Dinosaurs Say Happy Hanukkah? by Jane Yolen (Mark Teague, illus.) using Scratch Jr. Some of the students figured out how to add a speech bubble and several quickly learned how to add sound to their projects. The 2nd-grade students focused on coding the main characters and a main event from the story Hanukkah Bear by Eric A. Kimmel, which is about a nearly blind and deaf woman mistaking a visiting bear for a rabbi. These 7- and 8-year old kids quickly figured out how to use the app’s built-in editing and drawing tools and how to best animate a main event from the story. A growing body of research demonstrates the value of integrating coding instruction into reading curricula. While “coding” sounds intimidating, the basic practices of sequential ordering, textual application, and using multimedia tools works well even for young students.